Pay a visit to the spectacular Karalienes Liunas, also known as The Queen's Lion, which has an immense historical value for its legendary tales. One of these says that the scumbagger burned the altar of Milda Goddess and scratched it because he did not want to baptize and the other talks about the queen of this wondrous place who was thrown down the bottom of the lagoon, along with her carriage. 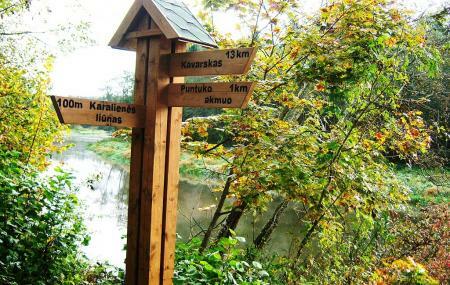 Located near the Azuzeriai village at the foot of the hill of Šventoji, this charming place is one of the largest sources of fresh water in Lithuania. You will be stunned and baffled with the tranquility of The Lion as the place is covered all over in dense forest. Find the joy in planning a D.I.Y. trip by using this awesome Alanta trip planner. You can add cozy hotels in Alanta like ÃÃ…Â½vejo Sapnas, GerugnÃÃ„— and Senoji UÃÃ…Â¾eiga. Curated Alanta vacation packages await! Book the best ones and start turning your dream into reality.Discover various ways for how to reach Alanta and complete the booking by choosing your mode of transport. Love this? Explore the entire list of places to visit in Alanta before you plan your trip. Fancy a good night's sleep after a tiring day? Check out where to stay in Alanta and book an accommodation of your choice.